How often a marvelous and stimulating view comes before the eyes of an artist; a view which the artist believes will most certainly be remembered because it has such an immediate impact on the stage of ideas. And then returning to the everyday life and patterns the image is gone and no amount of digging can bring that picture to the surface. It is this experience and the fact of human nature that recording an event in a sketchbook, however briefly, will help to preserve that memory for the artist to work with when back in the studio. When June returned from spending a month painting on-site at the John Day Fossil Beds National Monument and shared her pleine aire gallery on her website, I was reminded of how important those records are if a body of work on a theme remembered is to be created. The artist sketchbook is a valuable tool and I have some thoughts to pass along about what is helpful to me to pack along to make the recordings in those sketchbooks useful when I am back in the studio. A small case with a handle contains watercolor pencils and brushes with water-holding barrels for painting, several good felt pens, double sided tape for attaching bits that I find to pages instead of ending scrunched up in a pocket, a glue stick and a sketchbook travels with me everywhere in my car. This small kit is available to jot down a note together with a drawing wherever I may be, in the woods or at a museum. When I take a digital picture that is to help with my memory of a place or a bit that piques my creative juices, I leave a space in the sketchbook to place that picture when downloaded and printed. Sometimes it is months between my time in the studio and these sketchbooks hold the ideas and kernels that become art for me. Today there are some great on-line helps for creating an art journal or sketchbook at artjournals.com. There are also some fine books now on the market to provide ideas and guides for keeping sketchbooks and journals and one that is specific to sketchbooks for textile artists. There are on this list two of my bookshelf companions for many years by Hannah Hinchman; both well worth finding at a library. I find the words and the sketches provoke ideas every time they come down for a read through. I have included a picture of each of the books’ cover and a brief bit about their content from the Alibris website. Creative souls want and need a special place for recording and decoding their interior world a place to download all their creative ideas, a place to remember the events of the day, or a place to doodle, to draw, and to dream. Artists’ Journals and Sketchbooks is an engaging and intimate glimpse into the personal pages of a wide variety of select artists and journal keepers whose works not only provide visual delight and inspiration but evidence the intensity and devotion that such personal journals invite. Each project in this wonderful book is simple, yet will help you create a meaningful and personal place to keep your thoughts, write down your memories, or contemplate your future. 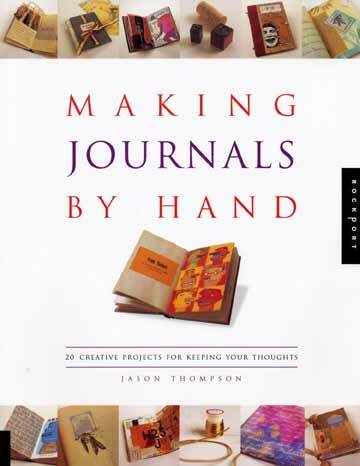 Making Journals by Hand offers illustrated step-by-step instructions for hand-crafting the journal that creatively meets your personal journaling needs. Learn how to make a journal which matches your mood, personal style, or specific purpose, including specialty journals for travel, weddings, motherhood, and many other personal places to track your thoughts, ideas, and feelings. Sketchbooks have been employed by artists through the ages. This tool can add much to the process of art making. Have you used a sketchbook (s)? Have you found ways of “remembering” the ideas you discover out in the world in your sketchbook(s)? Are there ideas for success in making and using the sketchbook you can pass along? Remembering is so much more simple when there is a map to view. Has anyone else found that ideas captured in a sketchbook more often than not die on the vine? I keep a haphazard sketchbook most recently defiling a lovely little moleskine (even leaving it in the rain one day). It’s taken me almost two years to only half fill it and almost none of those things have come to fruition although many other unrelated works have been finished. I am really coming to see the sketchbook as a graveyard for ideas. It is good to read how very differently each responder feels about the process of the sketchbook. I know that when I was studying fashion and theatre costume design in the 70’s I dreaded the sketchbook requirement for most courses and then came the one course where the entire semester was devoted to sketching and developing an idea and design elements until there appeared something so worth the effort of drafting a pattern. This process bode well for me as I designed for the stage and movies for over 20 years; directors always want sketches and details, especially for film. Constance Howard was my summer mentor for more than ten years during the time I was studying costume design and then working in the field. She came from Goldsmith’s Collelge in England and taught in San Francisco at the home of my dear friend Helen Wood Pope. There I stayed and drew and looked at each piece (maybe a stone, a piece of pottery or jewelry or a bird’s feather) I had chosen to study during the week. The drawing and looking and creating was, for me, a very good thing. Perhaps that is why the City and Guilds process appeals to me as I push myself into new dimensions in my artwork. As I wrote earlier, my sketchbooks are not for publication, are not slick and lovely to behold. Those sketchbooks do, however, hold my personal banking of ideas and snips of design I wish to incorporate in my fiber work. This subject was enlightening as I read how differently others see the process of recording in a sketchbook. It is a good thing that we all walk along our own road seeing, remembering and creating art that speaks of the muse within us that directs and guides us on this amazing journey of life. Thanks for participating and inputting a variety of perspectives on the subject of the sketchbook. I am heading down to the river now with sketchbook and camera to capture some wonderful, mostly white, large ducks I can see from my studio window who are passing though on their way north this spring. I have dozens of sketchbooks around my house, mostly because I set out on a trip and I’ve forgotten to bring one, so I buy another. They are a mess and full of mostly either exercises in working out a particular design or some hairbrained idea I have gotten and decided to sketch, usually over and over until either I tire of it or get a version that seems workable. If I’ve drawn something that is especially unsatisfactory I am likely to scrawl a giant X over the top of it. They contain sketches of some clothing detail I saw and liked, but will probably never reproduce because I seldom sew clothes anymore. They have little sketches of an architectural detail I might want to include in a someday dream house.The covers still have aging, gummy price stickers on them, and circles from coffee cups and bits torn off the corners for use as a bookmark. In other words, they are no more nor less than the scraps of paper and old envelopes that get ideas doodled on and are then stuffed into my wallet to be either retrieved for later use or disposed of as so much brain lint. I must confess that I view those beautiful artists’ sketchbooks that are so in vogue and so much a part of the City and Guilds approach, with a bit of amusement. They seem so overly precious, romantic and, at least for me, entirely useless. Well the sketchbook sits on the shelf in the studio – I had good intentions when I bought it and as I gather inspiration and drop it in the box on top of the file cabinet some time to be filed. Sunday I was looking for something and had to go through the files and boy did I chuck lots of inspiration – either to take to a guild meeting or directly to the trash. I keep thinking the sketchbook would be good but most of the time I use the digital camera and the book gets used for notes or sits on the shelf. Maybe should give it a try again. Ah, Clairan, “self-conscious.” That’s the precise word — and precise point at which I veer off on my own path, shedding the sketches and notes and detritus of the journaling process. Thanks. June, thanks. I’m sure I will keep producing art, as that is my love and passion, and truly the orderly, tidy, lovely sketchbooks are beyond me. They are self-conscious in a way my quick notes and jottings could never be, and that alone would take time away from my already precious time to work. However, they are, I think, their own form of art, just one I’ll not aspire to! Here I am, answering my own question….. I actually believe that keeping a “tidy” or “sequential and methodical” journal/sketchbook distracts me from my focus. I am probably as focused on making art as any artist I know. My limitations are health and age, but since my kid is grown, my husband is a great housekeeper and maintanance man, and I’m pretty much obsessed with my work, so I’m about as disciplined as it’s possible to be. For me (your mileage may vary, of course) the sketchbooks and journals and samples are only to solve a particular problem or record with my fingers as well as my eyes a particular vision. Once recorded or solved, I never return to those bits of writing and drawing. I stuff them on a shelf where my heirs and the future art historian can deal with them. I think Cities and Guilds correctly need some kind of apparently sequential (for the peace of mind of their students) and perhaps evaluatable (for the peace of mind of the instructors) notebooks and processes. But I’m not sure that for me that that kind of methodical accumulation of maybe or maybe not useful material would be helpful. It might be nice if I were 20 years old and had time to play, but I don’t have time enough left in my life to learn everything about embroidery stitches if I don’t need them for the work that I’m obsessed with. I sit on the same shelf with the two of you with regard to messy, disordered, definitely not for reprint sketchbooks. The City and Guilds process will be a huge stretch for me and I am willing to travel that road to watch my personal growth and design development and see if and how the ordered sketchbook process may be of assistance to better use the sketchbook in my life as artist. Perhaps the one carry along sketchbook will always remain my piece of remembering that travels in my car and in my backpack for the unexpected discoveries wanted to stay in the design/idea memory bank for later use in the studio. The new focused study sketchbook that is the part of developing a study into a work or series of works of art that I develop as a part of City and Guilds courses will be something different, new to me and beneficial in the process of art making, I suspect. Creating a lovely for publication sketchbook is not my intent nor a goal I forsee in my artist life. In those messy, confusing, dizzy little collections on the shelf in my studio are kernals of inspiration and they reside there waiting for me to see them once again and put them to good use. I do not share those personal jottings for they are, as I see them, simply the reminders I need to keep designing and creating when the muse is on holiday. The Hinchman maps intrigue me also, June, and I have made some feeble attempts in that direction. More time after retirement has them on my “I would like to do that one day” list. Sketchbooks are my friends and I treasure the companionship of those small remembering pages as I feed my personal artist life. I think it would be a good thing. I often think it. It would mean my being more focused more disciplined, more concerned about improving my skills by working on one skill at a time and building it up. But I find in real life, that doing all I need to get done in a day ( a husband, a child, an elderly father, an unemployed brother, cats, fish, a large house, etc etc etc) and getting into my studio to actually make work, leaves little time or frankly inclination to really hone my sketchbook skills. Perhaps at a later, less encumbered part of my life. But one wonders if that will ever happen, and if one should simply make an resolution to get started on it RIGHT NOW. I always wonder if there’s a reason (besides becoming rich and famous by selling your sketchbooks) to be “tidy.” Would we be better artists if we were better at maintaining a methodical, semi-presentable, set of journals? Is there a certain self-indulgence about not going straight through a single journal day after day, trying to sketch and or write or think through an art problem every day. Could we improve our work by laying out our artistic journeys in that linear fashion. I’m not asking about whether it would be good for others — I’m really asking if it would be good for our own art. This is not exactly a rhetorical question, although I have a smidge of an idea about what I actually think. This is, after all, how the Cities and Guilds courses build skills. I never never never want any other human being to see my “sketchbooks”! The notion of publishing my messes makes me shudder. My notes are truly made for me alone and they are not beautiful. Would that they were, ah! I love the Hinchman book, but just figured out that I’m intimidated, and thus put off by, the beauty of the final product. Those books are grand and glorious and beyond my capacity to imagine producing. I have sketch books, half-filled, notebooks, started and then dribbled out to blank pages, folders stuffed with articles and notes about books I’ve read, and finally computer folders filled with more photos than I’ll ever use. None of these is organized in the nice way the printed books are. I forget to take the current one so buy a new one. The ones I have are the wrong size for what I want to record so I buy another one. I see a sale — I buy another one. I want to do something crafty, so I make myself a handmade one. A friend gives me another handmade one that I can’t resist sketching this morning’s violet in. In short, my sketch/journaling books are a true mess. So my question is, does anyone have sketchbooks and/or journals that are like the published ones? 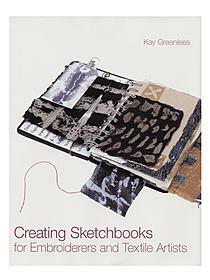 Or does anyone have the materials with their sketchbooks that could be edited to be published? By the way, Hinchman’s book “maps” some of her favorite sketching routes — the idea of maps of visuals, not to scale but with the elements of your life or home routes reallly appeals to me. One of these days…..
Kristin and Beth I agree with both of you with regard to how we record information in the sketchbook. My inclusion of books on the making of sketchbooks and/or journals was not to indicate that I believe that the sketchbook is the place for gallery quality work, although the books show work that is in my opinion often of that caliber, but rather as a place to ‘see” some options for the record keeping process. As I prepare to do the Kemshall’s City and Guilds courses it is clear that I must work on the quality of my journaling and sketching to fulfill the course work and it was in this prepartion process that I read the top two books. The others have been friends for many years and helped me in the process of record keeping. The sketchbook, for me, often contains those germs of an idea that may not find its way to the studio for several years. Because of this timeline issue in my art work the more detailed the notes the better. My sketchbooks are not gallery material but rather the repository of details, thoughts, and feelings and the motivator for a project when my muse is in hiding. Any way that one can record ideas is a help in future work and planning. Many of my inspirations have come from unexpected times and places. This last year I took more pictures of clouds and skies than I will ever use, yet within those pictures are images that jump start projects. The theme of a sketchbook is not presented to in any way limit or fence in creative thoughts and ideas. It is offered to encourage making a mark to aide in the process of remembering. Making sketchbooks has freed me to gather as many ideas as I can see rather than just looking for a particular image or idea for a single project. Now there resides in my studio a shelf bulging with pages of scribbles and suggestions of form and design, sometimes colored with pencils and washed with a wet brush to “save” the sight before me. Enjoy the journey of art making. Find what you can to add to your sketchbook(s) that speaks just to you and your muse. Visually, my sketchbooks have always been pathetic. But, I’ve used them for years and would be lost without these receptacles for notes and ideas. I use my sketch books to write down ideas and to make VERY rough drawings of ideas, or to paste in inspirational photos or those inevitable thoughts jotted on napkins. I wish I could create intricate drawings and colorful collages which are art in themselves, but if I had the time and focus to do that I’d be using it for my other art instead. So, for me the sketchbook is merely a convenient place to store the kernels of ideas for later retrieval when they can be fleshed out. My most successful sketchbook experience was during a week-long business trip to Europe where I had a bit of free time. I almost filled a small moleskine. I loved it. I loved taking the time to sketch and playing with ideas. I did a piece of art inspired by it and have more I would like to do. But the process didn’t translate so well to my day to day life. I lost the focus. I make efforts in sketchbooks and workbooks on a semi-regular basis. I’ll work in one for awhile. And then not. I want to be more thorough because I have seen benefits from those short stints. But somehow the art I’m doing now seems to get in the way of generating ideas for art to do later.